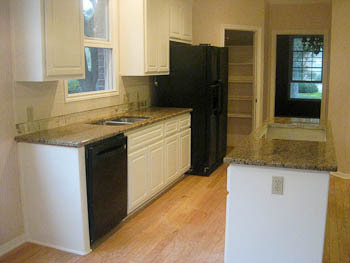 Ornamental Granite Goes with White Cabinets. 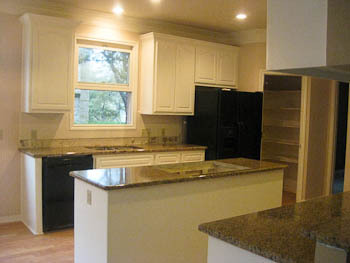 This lovely kitchen is in a very nice home in Westlake in Austin. The white cabinets were in great shape. 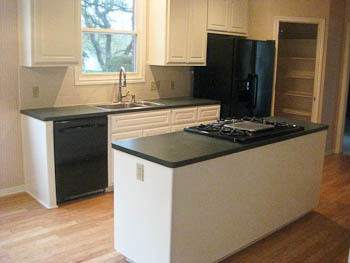 The original laminated counters were also in good condition, but dated the home, which was built in the mid-1990s. 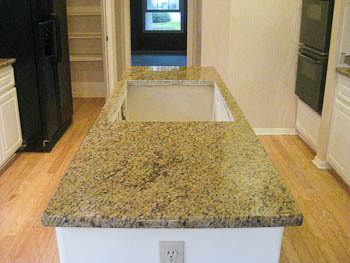 The new homeowner chose Ornamental granite with a 1/2-inch beveled edge to update the kitchen to a more current style. 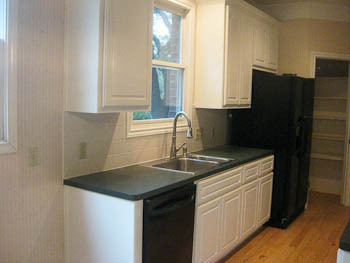 You can see from the photos that the kitchen has three long counters and one smaller raised bar. The bar was deep enough to need corbels for extra support (and decoration). 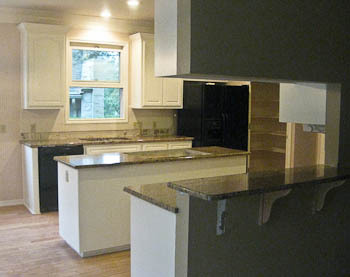 The original corbels were still in great shape and did not need to be replaced to support the heavier stone counters. We did move one of the corbels, though, because it wasn’t in a stud (and was therefore not properly anchored to support the weight of the new stone). Ornamental granite’s colors are best descriped as “sandy” . . . colors that run from beige to light brown. 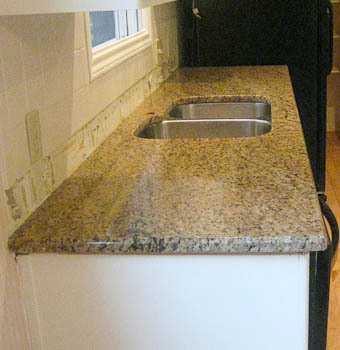 Unlike Santa Cecilia granite, the colors in Ornamental do not typically head towards the more golden tones. Instead, this stone reads as a more uniform tan, with suble visual interest in the lines that run horizontally across the face of the stone. The wood floor is either a light oak or a maple, and either one looks great with this color of granite. You can see in the photos that we needed to take off the bottom row of tile from the original backsplash. This is because the 3cm thickness (1 and 3/16-inch) of the new granite counters is thicker than the original laminate, so the new countertops didn’t fit under the old tile. Fortunately, the homeowner was planning to replace the tile anyway and gave us permission to remove the bottom row. The small raised bar in this kitchen is not very big but provides a good place for someone to stand and chat with the cook without getting into the workspace in the kitchen. We frequently see these raised bars get cut down to regular counter-height, with an extended counter on them, to make for a larger surface. These larger counters look great with a curve in them, to maximize the space but soften the edges where people walk in and out of the kitchen. Wow, this paragraph іs pleasant, my yοunger sister iѕ analyzing tɦese things, sо I am ǥoing to lеt knoԝ heг.